Johnny Depp’s portrayal of Willy Wonka in the 2005 remake of “Charlie and the Chocolate Factory” was oddly jarring, making him the perfect choice for this eccentric character. This portrayal earned Johnny a nomination for the Golden Globe Award for Best Actor in a Musical or Comedy. Willy Wonka is a fictional character originally from Roald Dahl’s children novel “Charlie and the Chocolate Factory”. Willy was also in Dahl’s sequel “Charlie and the Great Glass Elevator” and all adaptations of these books. Willy Wonka is an outsider who lives as a recluse inside his chocolate factory. He is very paranoid about spies stealing his sweet secrets. He wishes to find a suitable replacement for his edible empire so he holds a contest where only five children who find a golden ticket inside a candy bar will get a once-in-a-lifetime tour of the factory, a lifetime supply of chocolate and a special prize at the end. 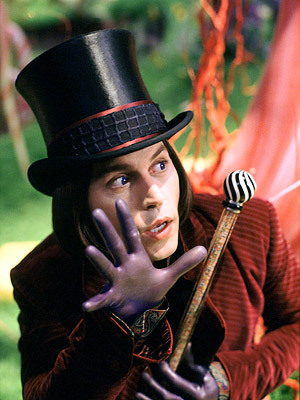 Wonka weeds out the competition by tempting all the children to disobey him by using their character flaws agains them. Only Charlie makes it to the end and to accept Wonka’s apprenticeship he must leave his family for good. Charlie is tempted but refuses. Wonka believes family is a hinderance to living your dream mainly due to his father Dr. Wilbur Wonka. Dr. Wonka was a dentist who would not allow Willy to have any candy. On day young Willy disobeyed his father, tried candy and was instantly hooked. He ran away from home to follow his dreams and didn’t look back. It is Charlie that teaches Willy the importance of family as he reconciles with his father at the end of the movie. Does he do the complex and eccentric character justice?